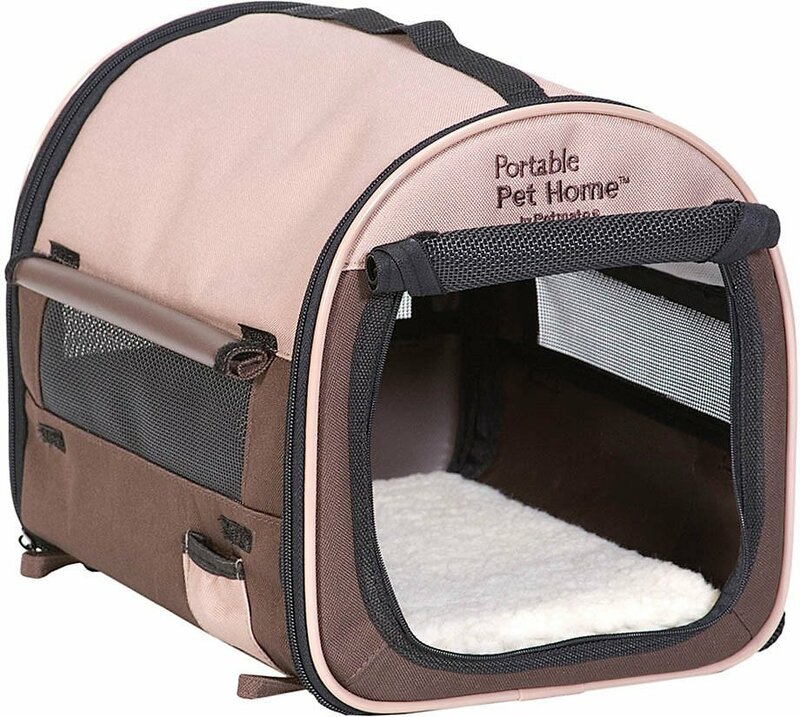 Let your pet feel right at home, no matter where you travel, with the Petmate Portable Pet Home. Easy to carry and easy to set-up, this essential traveling companion keeps you and your furry friend happy wherever you end up. It sets up anywhere in seconds and conveniently folds into a carrying case. 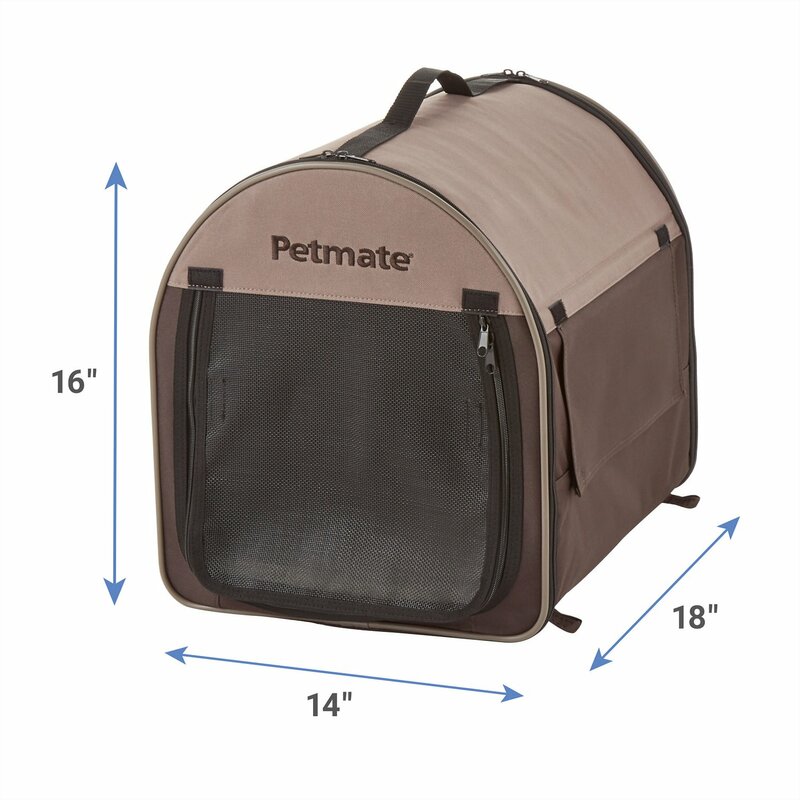 Made with a heavy-duty outdoor/indoor water resistant fabric 4 ground stakes included to ensure Fido's abode stays put. Climate control window covers on all four sides Storage pockets for all the doggy essentials. Bed covering a comfortable foam pad Zippered mesh door and upper side vents that can be rolled up and held open by hook and loop fasteners. Helps your pet feel at home, no matter where you go. Easy set up in seconds so it's perfect for traveling. Folds down into a carry case for easy portability. Heavy duty water resistant fabric for durability. Features climate control window covers. Pet home, (4) ground stakes. This little home for my tiny Yorkie, Ryley is one of the best purchases I have ever made. Getting her at just 8wks. old; I knew I was going to get the crying for a few nights, but she only cried the first night for just 20 minutes and hasn't cried since. She really loves it and also takes her naps in it;very light weight and you can transport it so easily. I also purchased the soft gray blanket that she lays on in the crate and a few little toys and she loves the little duck...just her size. I would definitely recommend these purchases and the customer service at Chewy's was remarkable, very satisfied with them. I tried crate training my rescue immediately after adoption. She has a lot of separation anxiety and I think a trauma with wired crates. She would scream, cry, and snap at the door of her wire crate. I tried something like this out that looks more like a “house”. I never thought I would actually see her to go into a crate willingly. It’s so cozy, she sometimes jumps off the couch from cuddling with me to sleep in it! 100% recommend, your fur baby will love it. This carrier is super nice, but it does seem super small. I bought a small, I have a 6 lb chihuahua and thought it would be perfect. Wish I would have gotten the medium. I will donate it to my local Rescue, they'll love it. My 9 lbs dog was able to paw at the door a bit and the zipper opened right up. Such a shame since it's just what I needed, just doesn't actually work to keep a dog enclosed. I received the item and it is very small. I know that it can fit my Milo but he does not have any room to move around. I should have ordered a bigger size. I will be returning this item and getting a bigger size. Love this item for my Mini Schnauzer. When I'm not using it, it folds into its own handy carrying bag. My cat, Jack needed a carrier to visit his vet. This carrier is perfect for him. I put it in my bedroom so he could get used to it before taking him to vet, and he loves sleeping in it.